The CEO of Apple - Tim Cook, unveiled two new iPhone's - the iPhone 6 and the iPhone 6 Plus at the Apple Event on 19th, September 2014. Since last year, Apple has started a trend of launching not one but two new iPhone's. Last year's iPhone models showed very little changes over the iPhone 5 in terms of design as both the iPhone 5C and the iPhone 5S were minor upgrades. This year Apple has stepped up their game and made tremendous changes both in design and hardware specifications. The most obvious change is the screen, both new iPhone's have bigger Retina HD displays. Both new iPhone's have rounded edges with a smooth metal surface that seamlessly meets the new Retina HD display. The volume buttons and the screen lock button have also received a nice upgrade. The elongated volume buttons are integrated into the thinner profile and the screen lock button has been moved to the right side for easy access. Apple iPhone 6 and iPhone 6 Plus supports fast wireless technologies (802.11AC WI‑FI and Bluetooth LE) and users can connect to more high-speed wireless networks in more places. The camera is still a 8 MP shooter, but Apple has added a new trick "Focus Pixels" - which improves auto focus and facial recognition. It also adds continuous auto focus while video recording. In addition to this, Apple has introduced a new service Apple Pay (currently available on iPhone 6 and iPhone 6 Plus), a step into the payment industry. 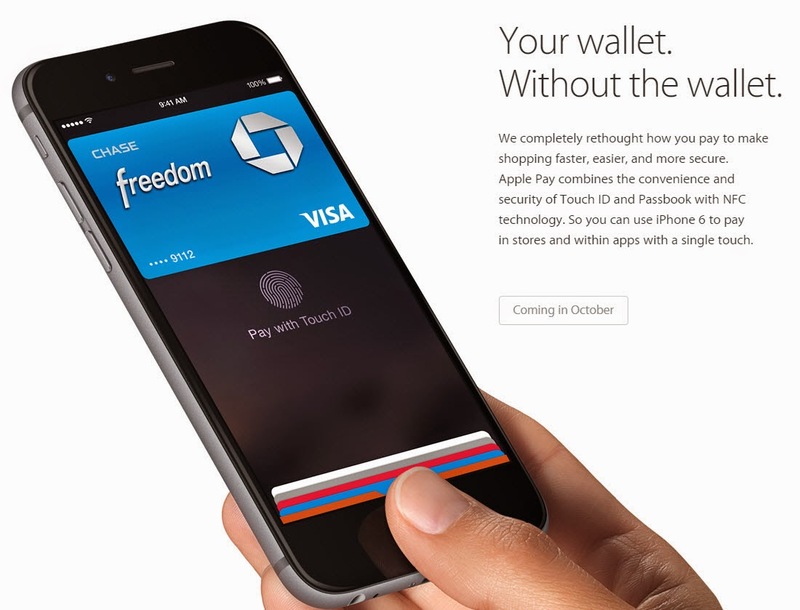 Apple Pay uses NFC and Touch Id to initiate the payment. Apple says their service is faster and more secure as the payment will be authenticated using your fingerprint, there is no need to enter credit/debit card pin, all you need to do is place your finger on the Touch Id to authorize the payment. 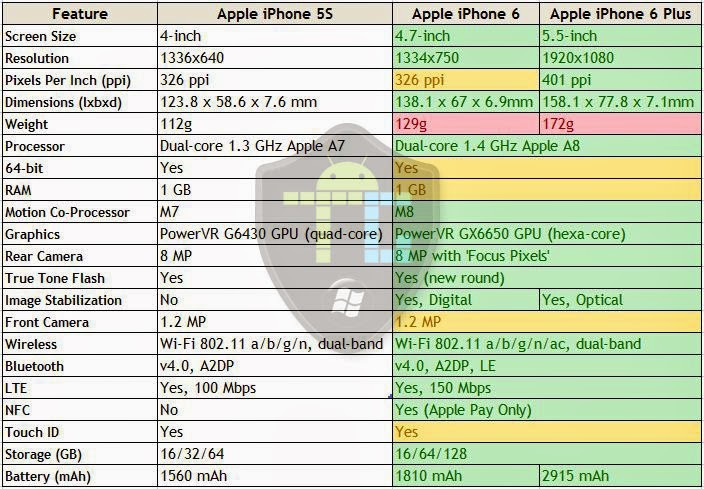 Let's take a look at the comparison of specifications of iPhone 5S, iPhone 6 and iPhone 6 Plus. From the above comparison, it is clear that the iPhone 6 and iPhone 6 Plus beat their predecessor (iPhone 5S) in almost every aspect. Fell free to let us know your view about the new iPhone models. Apple brand is developing from day to day! thanks for describing these new models!